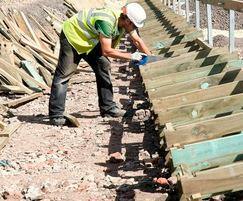 The Permacrib timber crib retaining wall system utilises the long-established gravity wall concept. The patented lightweight interlocking crib components form a series of open cell modules, which are filled with well-graded stone to create the mass required to counteract the earth pressures and surcharge loadings. Structural integrity is achieved through the interaction of the crib elements and the granular infill. 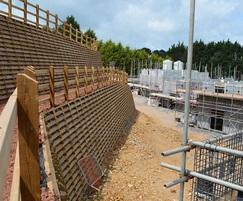 Permacrib is suitable for use in major civil engineering retaining structures and simple landscaped walls. 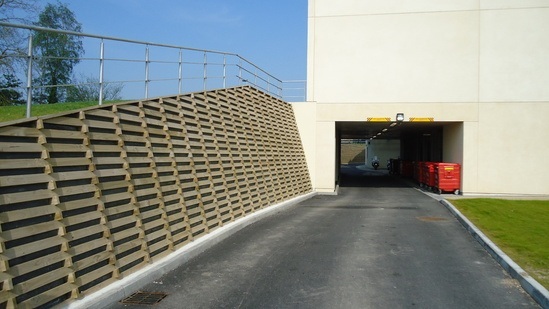 It can also be used to provide a landscaped and aesthetically pleasing face to reinforced earth or soil nailed structures. 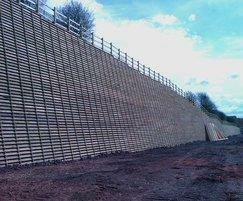 It can also act as a facing to sheet piling or concrete retaining walls, as well as creating vertical acoustic barriers. Environmental concerns for the conservation of resources and a sustainable future are met as Permacrib is manufactured from selected Radiata Pine softwood from managed, cultivated, renewable plantation resources. Manufacturing is carried out to an approved QA system ensuring a high level of dimensional accuracy. All machining is completed before treatment. All components are pressure-treated to BS8417:2011 using High Concentration Copper Azole preservative. Complete cell penetration is achieved to give full protection. Permacrib is treated and cured at UK plants which are subject to stringent environmental health controls and checks. All Permacrib components have a desired service life of 60 years. Eight models are readily available and their design versatility means header sizes can be mixed within the same structure for maximum economy, or in major structures double or triple skin walls can be built. 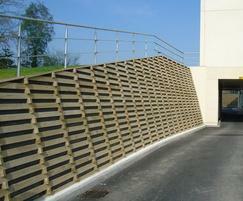 Face profiles can be varied to form benches to assist landscaping and enhance architectural appeal. Angle changes are easily formed and radii followed. Permacrib is delivered to site in either standard component packs or in special packs tailored to suit particular structures or construction sequence requirements. British Board of Agrément Certificate No 95/3115 issued in 1995. Patent protected. 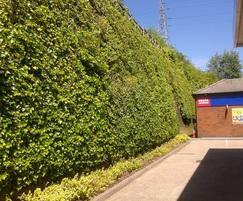 Permacrib can be fully landscaped with a variety of plants in order to enhance its natural appearance.